This category consists of two different ranges, Abha & Otto. Both are handwoven by Jacaranda carpets from pure wool, both feature a heavy weight boucle pile. Otto is one of the biggest boucles around and has a wonderful chunky feel. 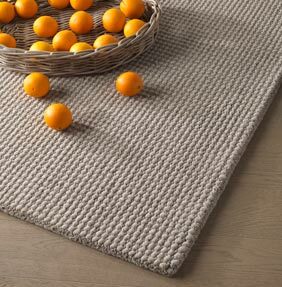 It is thick and soft underfoot, ideal for adding comfort and texture to any interior decor. There are five colours available, all undyed - Ivory, Beige, Iron Grey, Chocolate and Charcoal. Otto is also available in 4m and 5m wide wall to wall carpet. Abha shares all of the same attributes as Otto except it’s loop texture is not so large. The smaller loops are closer together and give a denser look. Abha is available in four different colours, Ivory, Oatmeal, Natural Grey and Charcoal. Abha is also available in 4m and 5m wide wall to wall carpet. Both ranges are stocked in three standard sizes, bespoke made to measure sizes are available to order.